Echo the same thing to all the other Dad's out there. Mine's 75 and was just diagnosed with prostrate cancer, he's doing fine right now. Can't be with 'em this year, but send my love. Now if I could just get my 12 year old daughter to remember me! As far as I know I do not have any kids. 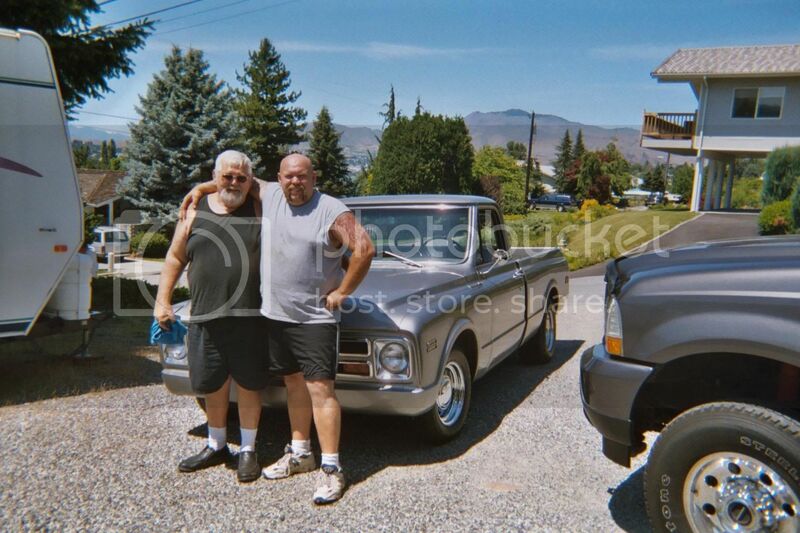 carl is there some kids out there that love chevelles and idaho grown spuds but dont know why ? Spib that's cool you have time to hang with your dad. My dad past away in 69 when I was twelve. He gave me the love of cars. To bad I can't share it with him. But on the bright side My two stepsons and two grandkids and I get to have alot of fun together. I can't wait to get my car out of storage so my grandsons can hang around and help me work on it. They tell me they are excited also. BTW nice chevy truck. Yeah Mark and his dad look like they have a very special relationship. I had that with my dad until he passed away. I miss him and I plan on taking him out for a spin in the 65 Sunday, if only in spirit. My dad had a 53 merc with a small block ford and four speed. He would dump the clutch and light em up. Man we would race around in that car. Yeah he's been with me bangin gears in spirit.